I’m so excited to share this beautiful pasta dish with y’all today 1) because it’s delicious and 2) because it uses really neat cooking techniques. First, this recipe interestingly uses *every part* of the vegetables. The usually-discarded parts, like the stalky asparagus ends and tough leek ends, are utilized to make a super-flavorful enriched vegetable broth that cooks the pasta, risotto-style. Cool, huh? Then, all the edible veggies are cooked individually in stages, to ensure that each is perfectly crisp-tender – no mushy veggies here! This dish is truly a perfect combination of flavors and textures. The pasta tastes delightfully nutty from being toasted and since it’s cooked risotto-style, the sauce becomes creamy and lush. The vegetables are perfectly cooked and the herb/lemon mixture added at the end lends tons of bright flavor. The result is truly one of the most delicious, balanced pasta dishes I’ve ever had. I served this with extra parmesan cheese, buttery bread and a crisp salad, and my husband + I both agreed that it was one of the tastiest dishes we’ve had in a long time. Add this to your must-try list, friends! 1. Place dark green leek trimmings, asparagus trimmings, 1 cup peas, 2 teaspoons garlic, vegetable broth, and 1 cup water in large saucepan. Bring to simmer over high heat, then lower heat to medium-low and gently simmer 10 minutes. While broth simmers, combine basil, oregano, and lemon zest in small bowl; set aside. 2. Strain broth through fine-mesh strainer into 8-cup measuring cup, pressing on solids to extract as much liquid as possible (you should have 5 cups broth total; add water as needed to measure 5 cups). Discard solids and return broth to saucepan. Cover and keep warm over low heat. 3. Heat 2 tablespoons oil in Dutch oven over medium heat until shimmering. Add sliced leeks and a generous pinch of salt; cook, covered, stirring occasionally, until leeks begin to brown, about 5 minutes. Add asparagus pieces and cook until crisp-tender, 4 to 6 minutes. Add remaining 2 teaspoons garlic and pepper flakes; cook until fragrant, about 30 seconds. Add remaining 1 cup peas and continue to cook 1 minute. Transfer vegetables to plate and set aside. Wipe out pot. 4. Heat remaining 4 tablespoons oil in now-empty Dutch oven over medium heat until shimmering. Add pasta and cook, stirring frequently, until just beginning to brown, about 5 minutes. Add wine and cook, stirring constantly, until absorbed, about 2 minutes. 5. When wine is fully absorbed, add hot broth. Increase heat to medium-high and bring to boil. Cook, stirring frequently, until most of liquid is absorbed and pasta is al dente, 8 to 10 minutes. 6. 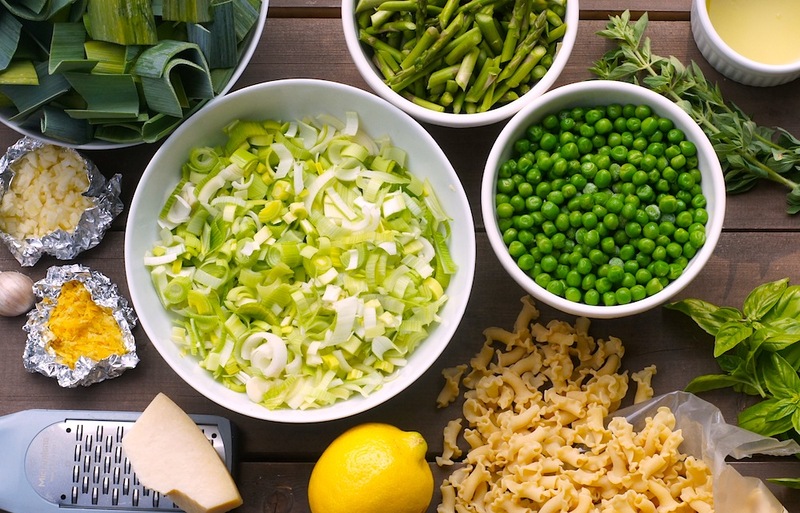 Remove pot from heat, stir in lemon juice, Parmesan, half of herb mixture, and vegetables. Season with salt and pepper to taste. 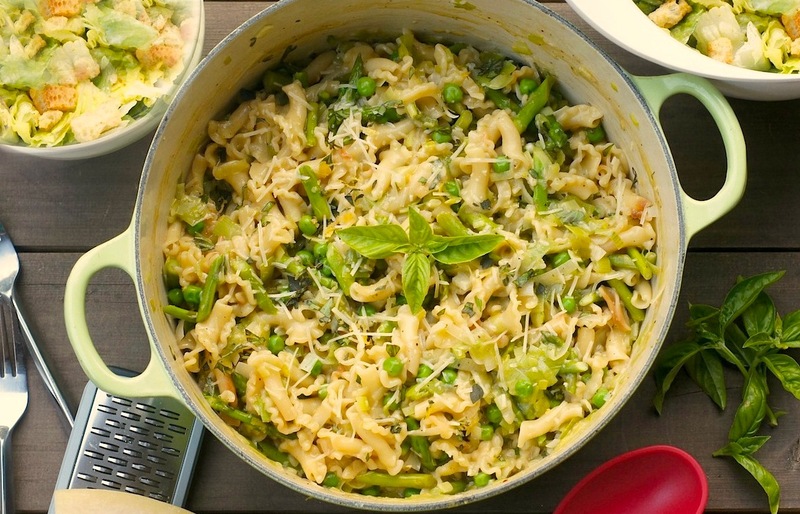 Serve immediately, passing additional Parmesan cheese and remaining herb mixture separately. 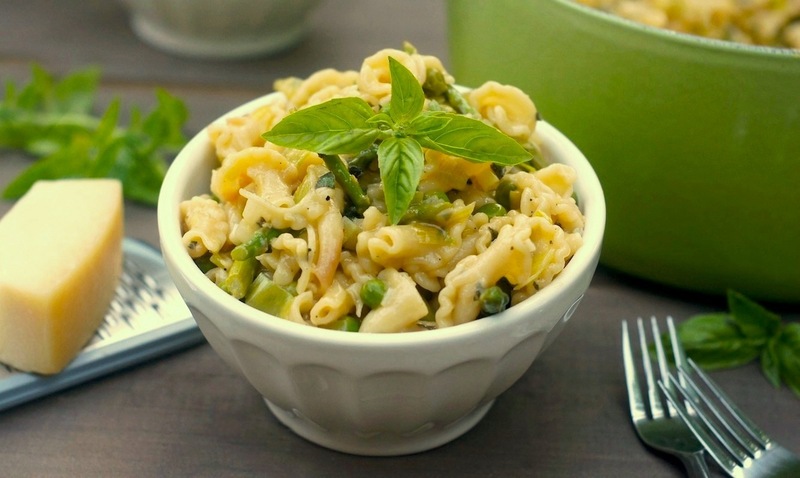 This pasta sounds just wonderful – I love the flavours and the fact that you make a stock from the veggies as well for an extra punch of deliciousness. Can’t wait to make this! I go nuts over pasta with veggies this time of year. I also don’t cook with leeks enough, so looks like I need this in my life. Great photos! I don’t cook enough with leeks, either, but I’ve been buying them recently when they’re on sale and they are SO good. Much easier to clean/cook than I realized before! Im intrigued – I love how this cooks like a risotto. I’ve never seen this done with pasta before. Oh wow you definitely talked me into this one. Love how every part of the vegetables gets used to enhance all the flavors! Chiming in along with everyone else, it seems, to say how awesome it is that the recipe uses every piece of the vegetable and starts with a quick stock! Brilliant! That creamy sauce sounds like perfection! Beautiful spring pasta, Amy! Love this Amy! So many vegetables…so much spring/summer goodness! Thank you for sharing. I can’t wait to try it. You’ve convinced me. I think this looks wonderful! This looks amazing!! I need to make pasta more often! Man, that looks delicious. I’m a sucker for lemon in a dish, though. Love it. We were just talking about doing a veggie dish tonight – this one is going to be the winner! Provided I can find the ingredients easily The Big Kroger, I assume. Wow, this looks amazing. From your description, I thought it might be too time consuming, but it actually doesn’t look too bad after reading the recipe! I think I could handle it with so many veggies, there will be no guilt eating a bit of pasta!